The easiest way to calculate a time difference in Excel is to simply subtract one time from the other. This works because Excel stores dates as integers and times as decimal values (see the page on Excel dates for more details). It is only the formatting of an Excel cell that causes the cell's contents to be displayed as a date or time, rather than as a simple number. Therefore, when you want to calculate the difference between two times in Excel, you can simply subtract the time values in the same way as you would subtract any other numeric values. Cell B3 of the following spreadsheet shows a simple example of how to calculate a time difference by subtracting the time in cell B1 from the time in cell B2. In the example above, the time in cell B1 is internally represented by the number, 0.156597222 and the time in cell B2 is internally represented by the number 0.428993056. Subtracting these two numbers gives the result 0.272395833, which, when formatted as a time, is 06:32:15 (i.e. 6 hours 32 minutes and 15 seconds). When you calculate a time difference in Excel, you may want the result to be displayed as a time. Clicking on the dialog box launcher in the 'Number' grouping, on the Home tab of the Excel ribbon (see rightabove). Using the keyboard shortcut Ctrl + 1 (i.e. press the Ctrl key and while holding this down press 1). Ensure the Number tab of the 'Format Cells' dialog box is selected. From the Category: list, select the option Time. Click OK to apply the selected format and close the 'Format Cells' dialog box. The following spreadsheet shows a simple subtraction of two dates and times. In this example, the date and time in cell B1 is internally represented by the number, 40562.875 and the date and time in cell B2 is internally represented by the number 40564.625. Subtracting these two numbers gives the result 1.75 which is Excel's internal value for the time 42 hours 0 minutes. It is likely that the standard time format (applied when you use the ribbon option to format a time) will only display times up to 24 hours. Open up the 'Format Cells' dialog box (as described above). Ensure the Number tab of the dialog box is selected. From the 'Type' list that appears on the right hand side of the 'Format Cells' dialog box, select a time format that displays an hour value that is greater than 24. Click OK to apply the selected format and close the dialog box. If Excel has a problem displaying the contents of a cell in a time or a date format, it will, instead display a row of hashes (see below). 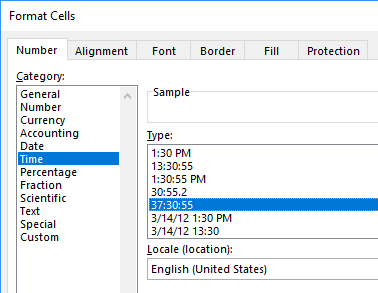 The cell may not be wide enough to display the time or date in the specified format. You can alter the width of an Excel column by dragging the bar (shown in the above image on the right) until the cell is wide enough for the contents. Alternatively, if you double-click on this bar, the cell should automatically re-size to fit the contents. Excel cannot display negative times. Therefore if the result of your subtraction formula is a negative value, and the cell containing this formula has date or time formatting, the result will be displayed as a row of hashes. You can display the underlying numeric value by formatting the cell with the 'General' formatting type.